The extremely popular FIFA franchise from EA Sports reached number 15. The demo of this new entry is out and available for all platforms: Microsoft Xbox 360, Xbox One, PlayStation 4, PlayStation 3 and PC. For the first time the Ignite engine used on Xbox One and PlayStation 4 is available also for PC. Goalkeepers have been rewritten and improved with 50 new save animations, new AI, last second save reactions and realistic tips and deflections. An all-new hub powered by Goal.com keeps you connected to the latest football news and action from your favorite club or league. Now that the Demo is out, the first thing we’ve noticed on PC is that the Ignite technology is a big step forward that really improved the game from better locomotion, realistic grass to more realistic keepers. Another features we like is the new "Emotional Intelligence" and the way players are affected in game by excitement, frustration, anger, or disappointment. Not only the goalkeepers are improved, but also the defenders. 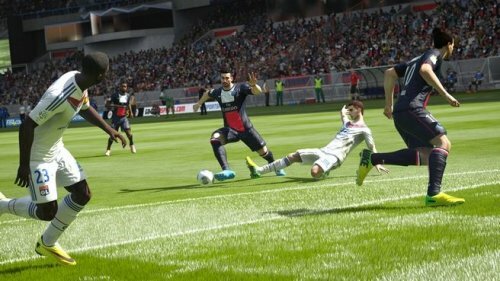 New animations have been created for them, from brushing players off the ball to shirt grabbing. The tackling are not so easy for newbies to master. The audio is also wonderfully responsive with improved commentary that highlight unique fan reactions. All of this completed with fans that don’t look like cardboard cutouts for once. The overall first impression is a much improved gaming experience. Fifa 15 is brighter than ever with sharper graphics and improved game mechanics. The game will be in stores on September 23rd in North America and on September 25th in Europe.